Over/Under: Over 164.5 at 1.90 Bet Now! This is a game between the sides that grabbed a win in the opening week of the Top 16 in Group F and whoever wins here but will be clear at the top of the table, for this week anyway. This means that there is plenty of incentive for both sides and these two teams have met twice before in European competition with the Germans triumphing in both games. Bayern picked up a strong road victory last week and now that they are playing at home this week, they will fancy their chances of extending their run. The Bayern winning streak in the EuroCup currently stands at 4, so they know how to pick up victories in games. Devin Booker has been a key player for the Germans, offering an average of 12.8 points per game and 6.4 rebounds per game so far this season. Nick Johnson has also been a key player, providing an average of 11.5 points per game while Max Kleber has slipped into double figures with an average of 10 points per game and 7.1 rebounds per game. These are the players that are likely to do the damage for the hosts. 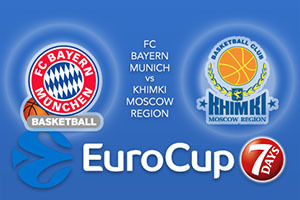 While Bayern are on a four game winning run, so are Khimki Moscow Region. This means that they will be no pushovers and in fact, the Russian side will think that they can cement their place at the top of the table too. Alexey Shved has been in fine form this season, he is the third best scorer in the EuroCup at the moment, and he has provided an average of 19.7 points per game so far this campaign. Jacob Pullen has provided an average of 11.2 points per game while Sergey Monia has offered an average of 10.9 points per game and an average of 5.1 rebounds per game. The bookies make this a close game to call so go with FC Bayern Munich at -1 at odds of 1.90. When it comes to the Over/under market, look to go OVER 164.5 at odds of 1.90. Bet Now!